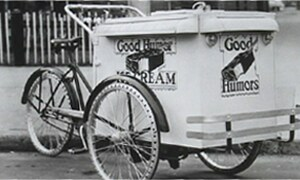 Almost 100 years ago, Good Humor® started a delicious revolution with the first ice cream on a stick and then the original ice cream truck. Millions of tips of the Good Humor Man's hat later, we're still bringing tasty frozen treats to hands and homes across America. 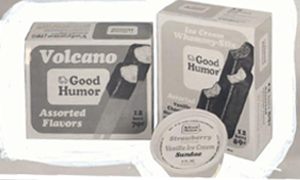 The Good Humor name came from the belief that a person’s "humor", or temperament, was related to the humor of the palate (a.k.a., your "sense of taste"). And we still believe in great-tasting, quality products. After waiting three years for a patent, Burt took a trip to Washington, D.C., in 1923 with a five-gallon pail of Good Humor bars for the patent officials to sample. It worked – his patent was granted. 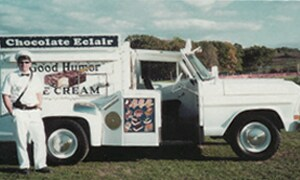 A Good Humor plant opened in Chicago in 1929. The mob demanded $5,000 in protection money (that would be almost $70,000 today), which was refused, so they destroyed part of the Chicago fleet. During the Great Depression, Good Humor introduced a bar for 5¢ – half the price of a normal bar. In the early days, Good Humor men were required to tip their hats to ladies and salute gentlemen. 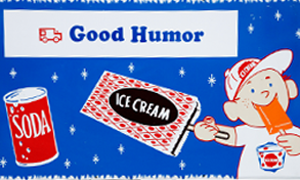 It took three days of training and orientation to become a Good Humor Man. 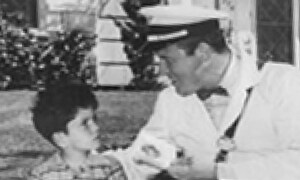 Jack Carson starred in the feature motion picture, The Good Humor Man. 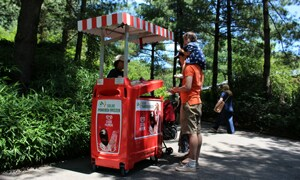 There were over 85 Good Humor ice cream products. 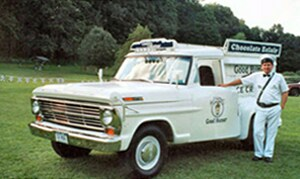 Good Humor sold its fleet of vehicles in 1976 to focus on selling in grocery stores. 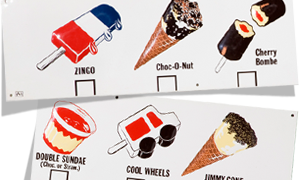 Some of the trucks were purchased by ice cream distributors and others were sold to individuals. The trucks sold for $1,000 - $3,000 each. 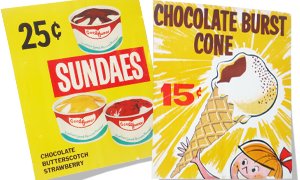 "The Classics" – Candy Crunch, Chocolate Eclair, Strawberry Shortcake, Toasted Almond – were re-launched in 1992. Robert Gant became the new Good Humor Man in 1996. 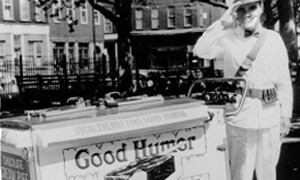 Almost a century after the Good Humor Truck revolutionized the delivery of treats to people of all ages, we launched the first-ever commercially viable solar-powered freezers in New York City.